Tameson offers a suitable plastic or rubber hose for every application. The most commonly used materials are PU (polyurethane), PA (nylon), PE (polyethylene), PTFE (teflon), PVC (polyvinyl chloride), rubber and silicones. Which hose material is most suitable for your application depends on several variables. Which medium will flow through the hose under which pressure and temperature is important, for example. In the overview table of Tameson you can find out which hose materials are suitable in combination with a certain liquid or gas. Other important selection criteria that will influence the choice of materials are for example the bending radius, kink resistance, the wear resistance, the weight, color or suitability for foodstuffs. Plastic and rubber are used for numerous hoses that are used in applications with compressed air, hydraulics, fuel, pneumatics, drinking water, food / drink or aggressive media. Every material has advantages that come in handy in a certain application. Also, each hose has disadvantages that can have great adverse effects in another application. To get an idea of this, in the Tameson article on hoses you will find a table with the chemical resistance, the temperature range, pressure and main applications of the most commonly used hose materials. A commonly used material for hoses is PU. PU combines the good properties of plastic and rubber and is often used in pneumatic systems to connect valves with actuators. PA, on the other hand, has good chemical resistance and is harder than PU. However, it is less flexible, so it is often used for compressed air distribution where straight pipes are common. PE is similar to PA, it is also harder than PU. PE is light and floats on water and is often used for pneumatic systems with low pressures. PTFE is almost chemically inert. It is a strong insulator and has very good heat resistance (up to 260°C). 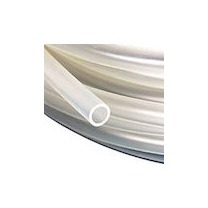 PVC is less flexible than PU but is also considered fairly flexible. Some rubbers can withstand oils and fuels and are relatively stiff. Common rubbers are NBR, EPDM, CR and FKM. A hybrid between a plastic and rubber is silicone. It shares many properties with plastic but has a much better chemical resistance. Often it is more resistant to high temperatures. If you have additional questions about hose materials, you can consult the article about hoses or contact our customer service.